Unicorns are the darlings of the tech community, and a target of many economies around the globe. Creating more of these privately held companies that are valued at least $1 billion is the name of the game. Not because the monetary valuation of these scale-ups ultimately counts: it is the WOW factor of scale-ups like Skype, Airbnb and Alibaba, and their (expected) positive effects on society that matter. Digital maps available for free, talking to your friends with live video can be done for free, having access to a highly diverse set of apartments around the globe, platforms enabling anyone to invest in startups are the results that matter. There are lot of different Unicorn lists, since Aileen Lee of Cowboy Ventures coined the term in her 2013 TechCrunch article: Welcome To The Unicorn Club. Dependent on the specific criteria the number of unicorns ranges in different data sets from 99 to 274. This difference in numbers is an interesting topic to dive into as we will do in our next blogpost. Fortune has identified 174 of these unicorns. For now, our interest is to understand what a look at the number of unicorns around the globe tells us. Many herald the USA and more in particular Silicon Valley as the world’s seedbed of unicorns. Others see China as the most important newcomer in the global unicorn club. Our questions are: what is the distribution of unicorns around the globe, and which country is most productive in creating them? In absolute terms most of them can be found in the USA (and yes, mainly in Silicon Valley – California: 65) and China. This is in a sense not remarkable, due to the sheer (population) size of these countries. More remarkable then is the relatively small number of unicorns in large countries like Russia, India, Brazil, and Indonesia. And if we look at the productivity of countries (measured as the number of unicorns per 10 Million inhabitants) Singapore, Israel, Sweden and yes, the USA stand out. If California would be a country, it would trump all others, with 17 unicorns per 10 million inhabitants. Four important conclusions can be made on the creation and distribution of unicorns around the globe. 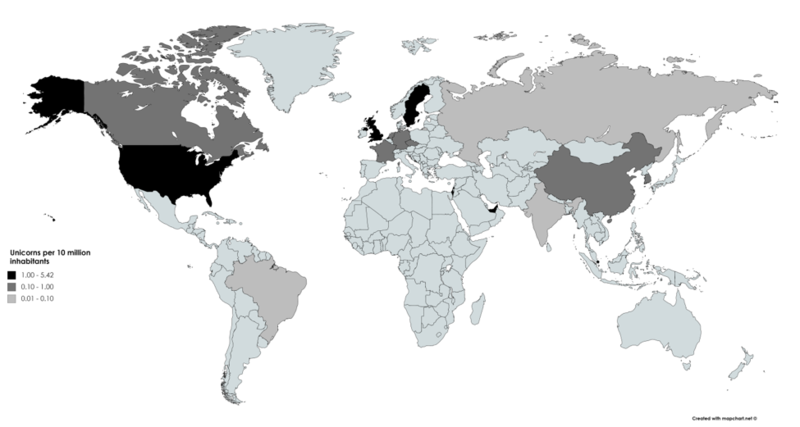 First, it’s a small numbers game: there are 174 unicorns created by just 16 countries. Second, all continents have produced unicorns, except Africa and Australia. Third, you don’t have to be a big economy to be productive in this game; small open economies like Singapore, Israel, Sweden, the Netherlands and the United Arab Emirates punch well above their weight. Fourth, countries that have a mix of a culture of ambition, a highly educated labor force and suitable labor market, a well-functioning capital market, and a focus on innovation are potential candidates for the production of unicorns. 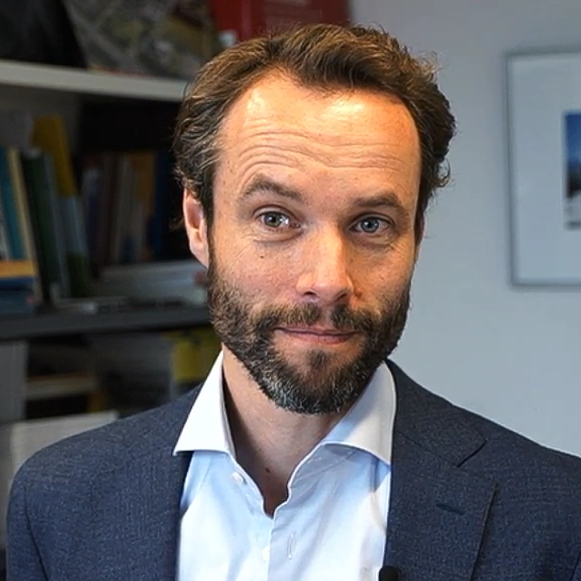 Erik Stam is full professor strategy, organization and entrepreneurship at the Utrecht University School of Economics and the academic director of the Utrecht Center for Entrepreneurship. He is currently visiting professor at Oxford University’s Saïd Business School. His research on entrepreneurship and development has been published in leading economics, geography and management journals, and he is consistently ranked among the top 10% authors in the field of Entrepreneurship. 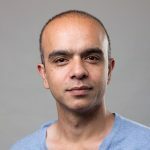 Samir is a partner and consultant on digital strategy, customer development, product management and growth marketing to corporate clients at Node1 and a mentor to a range of startups and co-founder of the premium blog on the Dutch startup ecosystem StartupJuncture. Previously he was an advisor on the Dutch startup ecosystem to former EU commissioner and Special Envoy for startups Neelie Kroes. He also helped her team to launch StartupDelta, the Dutch national initiative to promote the Dutch startup Ecosystem. Saberi and Stam are currently working on their upcoming book on the Dutch startup ecosystem. Photo Credit: Román Díaz and Gonzalo Follow.